For Thanksgiving this year we decided to try something different; nothing is like my mother’s turkey so I wasn’t even going to try. So we decided to not only try something different but completely new. It was a wonderful opportunity to just go out to dinner and celebrate that way. I had read about the restaurant Omero up in Pian dei Giullari/Arcetri right above Florence behind Piazzale Michelangelo organizing an evening with a Piedmont menu, giving you a chance to taste the regional cuisine as well as regional wines, such as the Barolo and Moscato d’Asti. I’d heard of Omero before but had never gone so this was the perfect chance to try it out. As we arrived, we realized the front part is a store with lots of prosciutto hanging from the ceiling while the rest of the small shop contained oils, cheeses, sauces and much more. So even if you don’t eat here, it is the perfect stop for local specialties. We were a bit late yesterday so quickly headed further in and were soon seated in the main area just beyond. The ambiance of the trattoria is elegant without being pretentious, the room is surrounded by large windows that have a view over the hills and of Florence. A large fireplace was to our back but it wasn’t lit last night, it hasn’t been particularly cold yet in Florence. Getting to the menu, we had as a starter Tarta con Bagna Caoda + Battuta di Fassona con Castelmagno di Pianura: Wow, the tartare was delicious and I don’t generally eat it! It was infused with a citrus flavor making it really tasty. It was accompanied by a cool vegetable cake and a small selection of raw vegetables to be dipped in the warm, spicy sauce known as bagna caoda. We were then served Panissa Vercellese, which we soon discovered was a risotto with beans. It was quite delicious and filling, in retrospect maybe a bit too much! The main dish consisted of two types of meat, the Lonza di Maiale con Castagne were slices of roast pork with a chestnut sauce on top while the Brasato al Cacao e Barolo – was Barolo braised beef served with a cocoa sauce on top. Both were surprisingly delicious and very different from what is local Tuscan combinations. The cheese plate with three types of cheese came next: a soft, creamy cheese similar to Gorgonzola but not as strong, a piece of the Castelmagno di Pianura we tasted in our starter dish which was semi-aged and a last, much aged piece of cheese. I don’t know the names but I’m going to have to find out, as they were all three very good in themselves. By this point my taste buds were a bit on overload, though. Our dessert was called Dolce della Miando, which we discovered to be an amaretto based cake with pears, drizzled with chocolate sauce – yummy! Lastly, we were offered a few pieces of the softest, melt in your mouth chocolate with hazelnuts I’ve ever tasted. We were in heaven, maybe in glutton heaven given the amount we had put into ourselves :). Last but not least came surprise entertainment provided by Francesco Meraviglia who turned some card tricks for all of us: we truly do not know how he did managed to invisibly move cards from one stack of cards to another being held by members of the audience or how he managed to guess which ones were pulled by others from the deck. It was a great conclusion to the evening. An important component of the dinner were the wines. Every dish was accompanied by a regional wine, all from the Poderi Luigi Einaudi estate for this special night. The first two courses were accompanied by the estate’s Dogliani – Vigna Tecc from 2009 which was light and fruity. The main meat dish was accompanied by the Barolo Costa Grimaldi 2006, also the perfect full bodied wine to go with the tasty sauces covering the meats. The cheese plate was accompanied by the Barolo Nei Cannubi 2004, full and velvety to counter as well as balance the strong flavors of the aged cheese. With our dessert nothing less than a deliciously fruity Moscato d’Asti. The evening was the first dedicated by Omero to the regional cuisines of Italy as part of the “Gastonomic Tour of Italy” to celebrate Ital’s 150 years of unity. In the following months, regions from the north and south will alternate to give both locals as well as visitors to Florence the chance to taste the great variety of Italian cuisine without having to travel all over the boot. Dinner was € 40 per person, reservations are a must for these dinners. Given the chance to travel to another region of Italy through a meal, we look forward to going back soon, maybe to Sicily or Calabria. On any other night, you can still enjoy the trattoria’s menu of traditional Florentine specialties served in an elegant setting and a large wine cellar with over 300 wines. 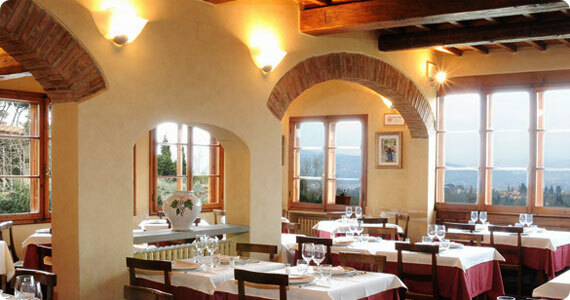 We will also have to head back to Trattoria Omero to taste their local dishes soon! You can find more information on Trattoria Omero on their website as well as stay tuned for future special dinner events through their Facebook page. Searching for great Piedmont Barolo and Moscato d’Asti? Take a look at Poderi Luigi Einaudi.